Panzerkampfwagen V Panther ausf G with FG 1250 Sperber (Sparrow Hawk) infrared Nachtjager (Night fighting) vision scope installed on the commander's cupola in place of the MG42 machine gun. This advanced (at the time) device consisted of a 300mm (11.8 inch) Infrarot-Scheinwerfer (Infrared Searchlight) connected to a Bildwandler or "Biwa" (image converter) and a device that sensed the elevation of the main gun. Only the Panther commander could see the infrared spectrum; he had to give directions to his crew. Six Panthers with Sperber would work with one SdKfz.251/20 Uhu (Owl) half-track with 600mm (23.6 inch) infrared searchlight, which extended the range to 700 meters (765.5 yards). Additional infrared gear for machine guns and the MP-44 assault rifle were also developed to give escorting infantry infrared capability as well. The Panthers were upgraded with Sperber by Maschinenfabrik Niedersachsen-Hannover (MNH) between September and December 1944. Sperber was affected by shock and by infrared pollution; all Panthers had covers installed to hide the heat from their exhausts. The combat history of the Sperber is the subject of debate. Sperber was probably used on the Eastern Front during the battle for Hungary in 1945. Sources say either fifty, four, or one Sperber Panther was tested there. 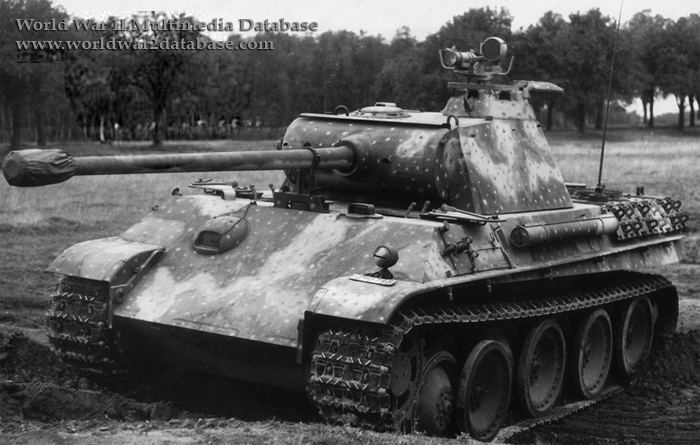 Other sources claim the Sperber Panther was issued to 3.Kompanie, 24th Panzerregiment, 116th Panzerdivision for Wacht Am Rhein, the Ardennes Offensive. But no record of Sperber being used on the Western Front is considered definitive. Two stories of Sperber Panthers on the Western Front exist. One states that Sperber Panthers attacked American anti-tank artillery position at the Weser Elbe Canal and destroyed the unit; another Sperber Panther unit destroyed an entire platoon of British Comet tanks. Both stories are probably apocryphal; some researchers claim that Sperber was never issued to the Western Front. A further development gave infrared searchlights and imagers to the driver and gunner as well. In the present day, most armies have passive devices that will target infrared searchlights.